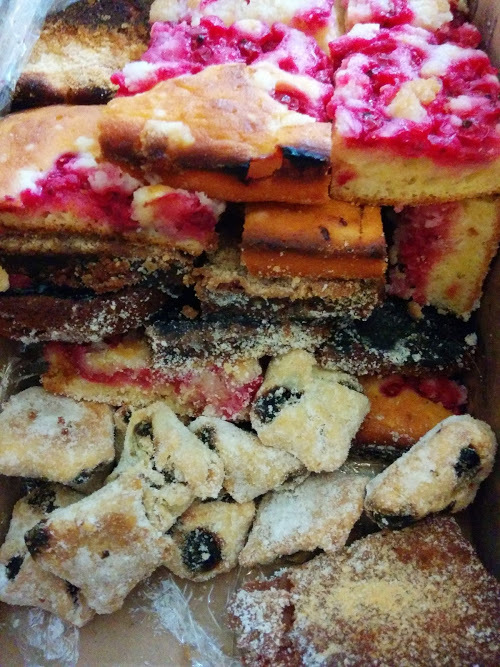 While I was looking for some photos of the plum dumplings, I found this photo I took of all the delicious cakes that J’s mom and grandmother sent us home from Czech with one time: plum pastries, cake with cherries and another one, perhaps apple strudel). In Czech republic they often eat cake for breakfast, it’s great. So with these homemade goodies we had breakfasts lined up for a few days that week. Must learn to make these! The cakes are normally still around in the afternoon too, so that would work 😉 But the main meal of the day there is lunch so normally I’m so full afterwards that I can’t look at food again until dinner! Porridge is great for breakfast too, I used to eat that in South Africa but somehow got out of the habit here in Germany.